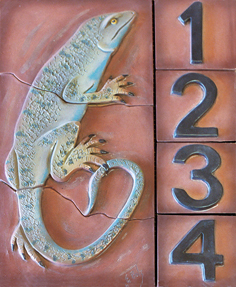 This address tile is made in seven pieces and can be directly attached to a house or wall and grouted, or framed onto a post etc. Colors and numbers (of course!) can change with each piece. All color and glaze is fired on, making it durable for outside. Price: $295 plus any installation charges or shipping.